"9 Dream travel destinations in the world 2014," selected by CNN of US cable television. Along with the tree-lined avenues of Madagascar's Bao pub, Giraffe Manor in Kenya visited by Kirin, Hayman Island, the world's largest coral reef, Great Barrier Reef and hotels with a glass ceiling overlooking Aurora in Finland, there are only spots ranked from Japan. That is the “Ashikaga Flower Park”, which is admired as a fantastic sight like the tree of the soul of the movie “Avatar”. The largest wisteria plant in Japan, 94,000 square meters, is a fantastic tree where the symbol of 150 years of age and the 80 meters of the white wisteria tunnel, spring flowers and blue purple, pale red, white and yellow wisteria weave I will fascinate the landscape. The expression of flowers one by one, collaboration of flowers with the sky or waterside. The world of dreams spreads. Spring flower festival in Ashikaga Flower Park! "Fujino Hana Story- Old Great Wisteria Festival 2018"
At Ashikaga Flower Park in Ashikaga City, Tochigi Prefecture, "Fujinohana story ~ Big Wisteria Festival 2018" was held from April 14 (Sat) to May 20 (Sun), 2018. On April 1, 2018, the new JR station "Ashiga Flower Park" was opened for the first time in 35 years in Tochigi Prefecture. The distance from the station to Ashikaga Flower Park is a 1-minute walk. During the Golden Week, many tourists from around the country and from abroad visited for a dream world early in the morning. As soon as you enter Flower Park, you will be greeted by the color and smell of spring flowers that are illuminated by sunlight. This year, as with cherry blossoms, wisteria flowers and azaleas bloom as early as a week, and Light Red Wisteria, Old Great Wisteria, and Yae-kokuryu are in full bloom, White Wisteria is in almost full bloom, and Yellow Wisteria is beginning to bloom. I was able to enjoy all the colors. In addition to wisteria flowers, various types of flowers, including azaleas of more than 5000 stocks, bloom in the garden and they are just gorgeous. “ Great miracle wisteria” The age is 130 years old. Above all, "Great miracle wisteria" shows a big presence. The Hayakawa Farm, which was opened in Horikome town, Ashikaga city, Tochigi Pref in 1968, was relocated to the current Sema town, Ashikaga city in 1997 for urban development, and opened as Ashikaga Flower Park. There was a 130-year-old Great Wisteria which was loved as a "250-tatami mats" in "Hayakawa Farm", but that Fuji was forced to transplant by the relocation of the garden. 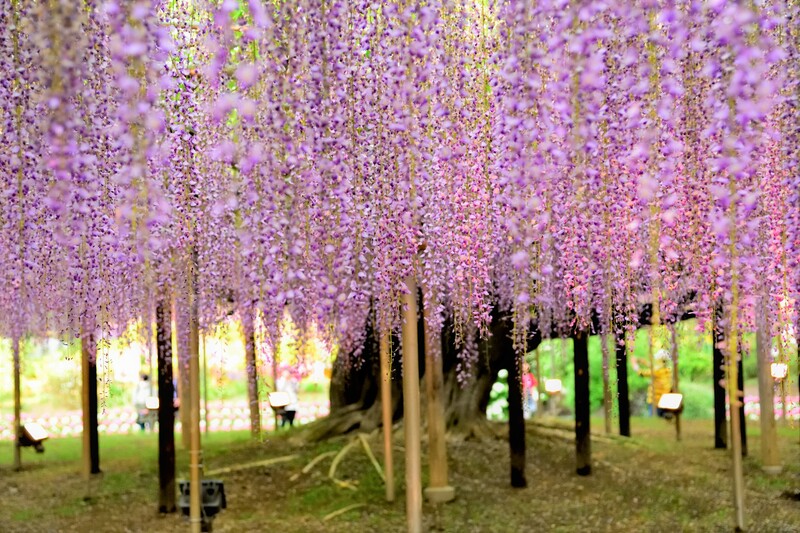 At the time, it was said that the transplantation of such a large wisteria was impossible, but Konami Tsukamoto, the first female tree doctor, succeeded in the transplantation and surprised the wisteria lovers around the world. When I saw "Great miracle wisteria" grown to a shelf area of ​​600 tatami mats (about 1000 m2), my heart was moved. Seeing the lustrous color and strong stems of wisteria in bloom that overcame the difficulties, I felt heartwarming as being wrapped in tenderness. When the darkness of the night deepens, the beauty in the park is mysterious! The brightly lit Great wistera, the pure white rattan that looks like a wedding dress floating in the dark, the wispy wisteria that colors the enchanting tunnel, creates an unreal world. On the surface of the water, a wide variety of colored widows appear, and it looks like it's swaying in the light! What a fantastic sight! By changing the light day and night, the rattle that changes its expression one after another warmly welcomes people around the world and wraps it up gently. It's just the kind of "Wineness" and "Welcome" of the Fuji flower language. Occasionally, the flower gently falls like a rain, sometimes it shines like a fireworks, and because of its charm, it grabbed the Japanese heart since ancient times. 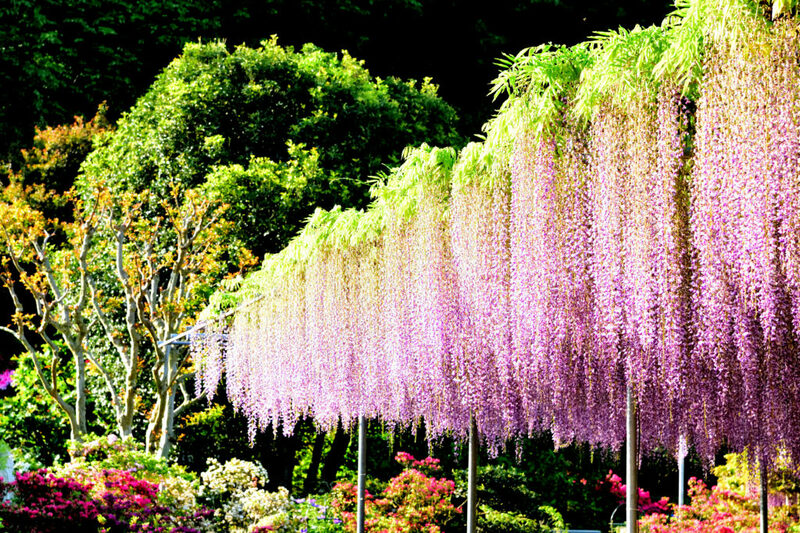 It has been a dream come true by the world of wisteria, which is loved by the world.